If you’ve had to search for a WordPress theme recently, you’ve probably realized how many are available. There are thousands of premium themes all claiming to be the best for your site, but many are relatively unproven. With all of those themes vying for your attention, some names will seem more familiar to you. Premium themes typically become popular because they work for many customers and are well supported, so you can generally be more comfortable with laying out cash for them. This article will look at some of the most popular premium WordPress themes for 2016, based on a combination of factors, and highlight some of their top features. Why Choose Premium WordPress Themes? Before we get into our selection of the most popular premium themes, let’s address the big question: why choose a premium theme when there are so many free themes available? For many people, a free theme seems sufficient and has the advantage of being free; however, there are some advantages to premium themes. Firstly, premium themes are often better quality than free ones because the revenue generated gets funneled back into future iterations. Additionally, premium themes typically come with support, which can help you get the most out of the theme and its features. When you add in the more advanced functionality, higher security standards, and more responsive updates found in premium themes, the advantages are clear. Once you’ve decided to go with a premium theme, you need to find them. You have two main options to choose from: marketplaces and theme shops. Marketplaces like ThemeForest and Creative Market have a variety of themes for sale, often categorized and with reviews and ratings to help you find the perfect theme. Theme shops like Elegant Themes (hello!) and StudioPress are more focused, but usually provide excellent support. Choosing a premium theme requires a little more thought than just looking at the price if you want to avoid making a mistake. You should also consider the reviews and reputation of the developers or theme shop and the support offered. Make sure the theme provides the features you need but doesn’t lock you in so you can’t change themes in the future. We’ve previously written a more in-depth discussion on choosing between free and premium themes. To start with, there really is no standard definition of “popular” when it comes to WordPress themes. A theme can be considered popular based on the number of downloads, installs or sales (i.e. quantitative), or based on the reputation or brand awareness (i.e. qualitative). Both measures of assessing a theme have their challenges. Using numbers seems like it would be the most objective method, but in many cases those figures are not available. While marketplaces like ThemeForest do show the number of sales, private theme shops often do not share their figures, making comparisons difficult. The other route of deciding on the most popular themes based on name recognition, brand awareness, or reputation is not an exact science. You could perhaps try to measure search engine queries for theme names, but there is still some bias likely to be introduced. Ultimately, there is a large element of unavoidable subjectivity in the process of identifying popular themes. We’ve used a combination of available figures, other rankings and overall reputation to create this list of our picks for the most popular premium themes. We capped our list at 15 to keep the post manageable, but there are of course many other themes that could be included on this list, so your picks might be different. Without further ado, let’s take a look at our list of the most popular premium themes for 2016! While we admit to being a little biased, it is no secret that Divi has become the most popular theme in the Elegant Themes arsenal. The flexibility of the in-built Divi Builder enables to you create just about any layout you can imagine. It’s perfect for non-technical users, but powerful enough for advanced users who want to completely customize their site. 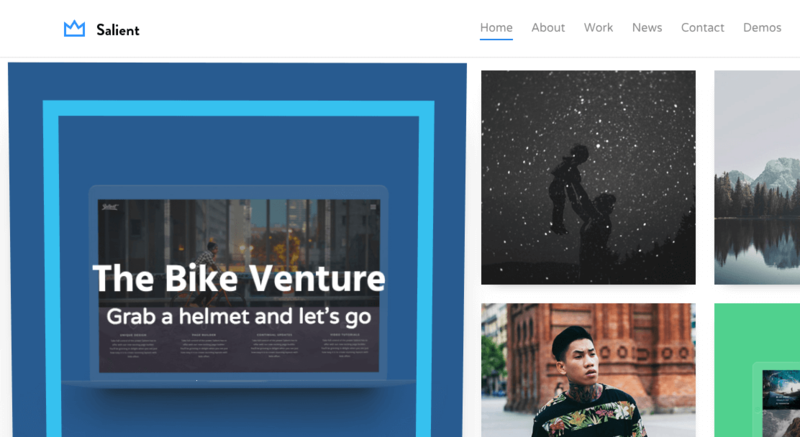 Currently the top-selling WordPress theme of all time on ThemeForest, Avada is described as a swiss army knife of a theme. 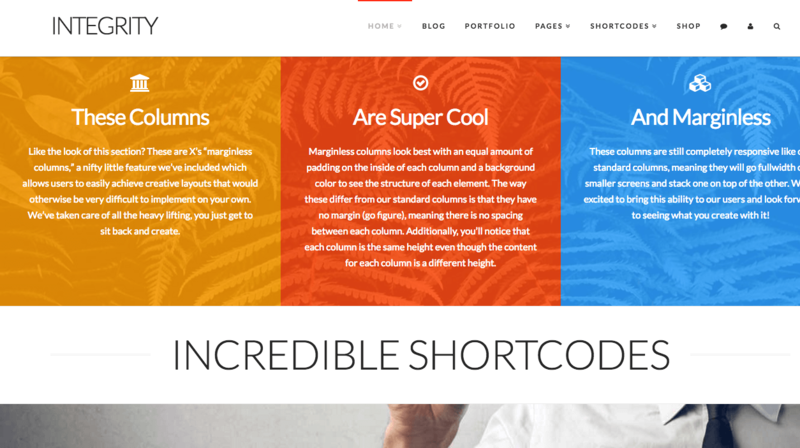 It includes powerful easy-to-use tools via its Fusion Core plugin, including a visual page builder, shortcode generator, and mega menus (to name a few). Combine those with advanced theme options and you can create completely unique layouts without touching a line of code. 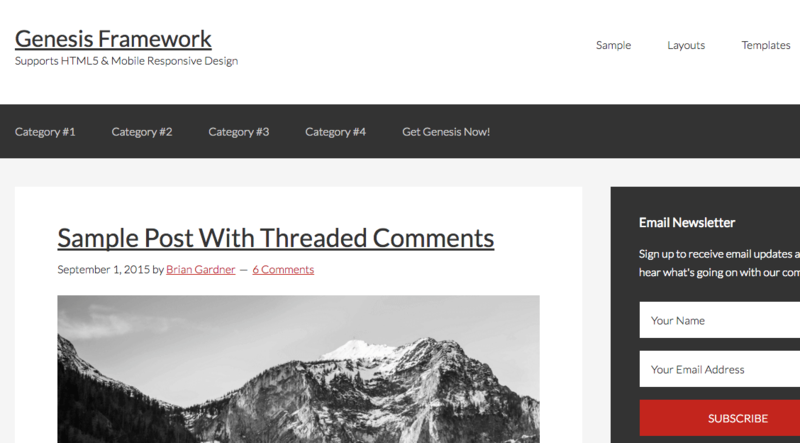 The Genesis Framework from StudioPress is a powerful theme framework which enables both novices and advanced developers to build websites with WordPress. The framework provides a secure, search engine optimized platform for serious websites. The wide variety of child themes available (such as the very popular Foodie Pro theme) provide unique starting points for custom sites. The fastest selling product on ThemeForest when it was introduced, X Theme continues to be a top seller. From their front end page builder – Cornerstone – to their custom built extensions and page elements, this theme makes creating unique websites easy. Four distinct design styles (called ‘stacks‘) are provided as starting points. 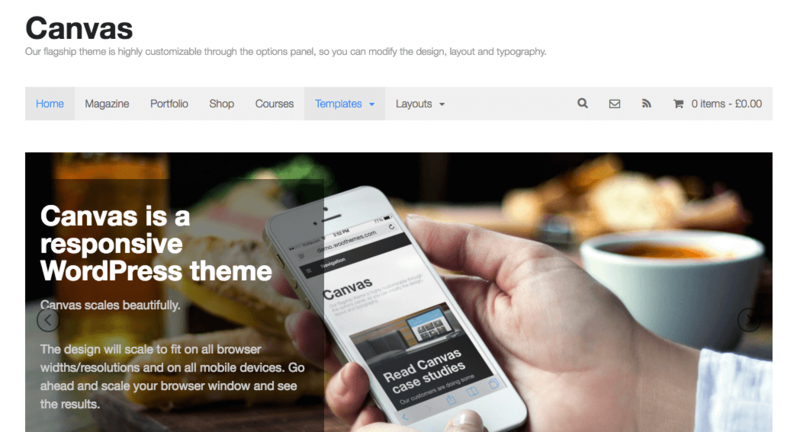 Canvas is a highly customizable theme from WooThemes, used by many as a starter theme for custom projects. The powerful options panel enables you to customize the design, layout, and typography of the site, giving you a custom look and feel. With out of the box integration with all the Woo plugins, including WooCommerce, Canvas is a solid foundation for your next website project. Enfold is another top-selling and highly rated theme on ThemeForest. The high rating is largely due to the theme’s focus on user-friendliness. From the drag-and-drop page editor to the outstanding support and step-by-step tutorials, Enfold is easy to use for those just getting started. Features like an integrated form builder and advanced options make it ready to provide you with a beautiful site in no time. BeTheme (like several of the other themes on this list) includes pre-made layouts for a quick start, but it claims to be the “biggest theme ever”, with over 190 layouts available. You should have no trouble finding a design to start your project which you can then customize using the in-built page builder. While you could use this theme to create general websites, OptimizePress has made a name for itself in the world of high converting landing pages, sales pages, and membership sites. The live page editor enables you to view changes immediately, as you start from 30 pre-tested templates. You can get OptimizePress as a plugin, so if you’re really interested in another theme, you can still add the OptimizePress magic. 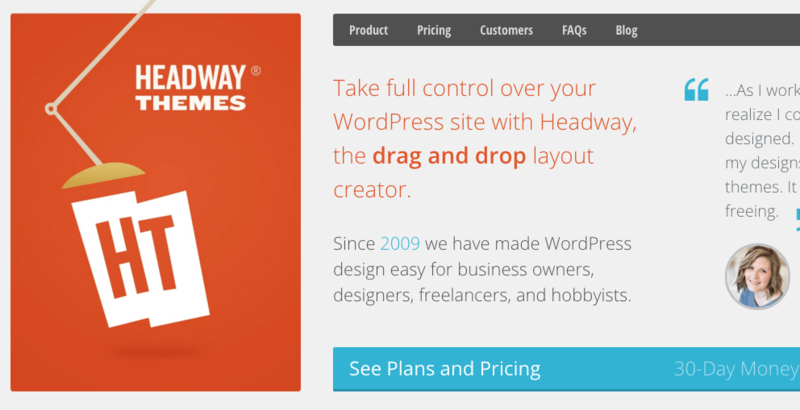 The granddaddy of drag-and-drop WordPress layouts, Headway has been around since 2009. You can start a page from any one of the pre-built layouts, then edit with the in-built visual editor. Create any layout, then completely customize through the Design Editor or custom code. Headway enables you to save snapshots of your designs so you can rollback changes at any point. Thesis departs from the standard WordPress theme philosophy and is a design and template manager. Without code, you can completely customize every aspect of your page template using a unique visual editor. With access to a Thesis API to add custom code as needed, Thesis does have a bit of a learning curve, but it is an extremely powerful way to work with WordPress. Built on the very popular free Responsive theme, Responsive Pro adds powerful customization features. You can use the Theme Customizer to modify colors, typography, and other options. The theme includes in-built support for major plugins such as bbPress and WooCommerce. This simple and flexible theme offers a good starting point without all the complexity of some of the other themes on this list. 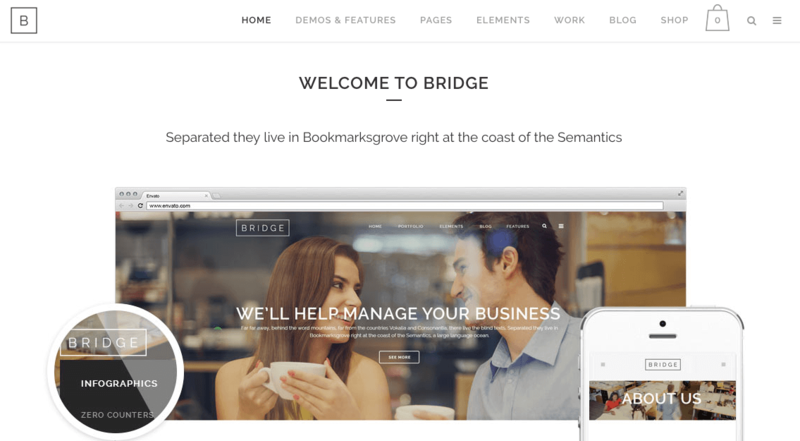 Bridge is a beautiful multipurpose theme and currently a top-seller on ThemeForest. With over two dozen layout concepts and over 100 demos, you can choose a starting point to fit any website project. With full typographic control, including font packs and access to custom CSS, you can create a completely unique design to meet your needs. The uDesign theme is a very powerful and user-friendly multipurpose theme that is highly rated on ThemeForest. A focus on Search Engine Optimization (SEO) and making sure the theme is completely responsive and mobile-ready makes uDesign a solid choice. Powerful customization options and over 2,000 fonts to choose from will help you transform your site into something unique. Salient aims to provide you with the platform to create beautifully responsive designs with their theme. With over 1,000 icons, over 600 fonts and unlimited color possibilities, your theme will be completely unique without touching code. A powerful theme options panel and an advanced page builder enable you to go deeper into modifying your site and page layouts. This list wouldn’t be complete without throwing an e-commerce specific theme in the mix. Flatsome is the top selling WooCommerce theme on ThemeForest. The included page builder enables you to create any layout for your store’s pages. The theme also includes e-commerce specific features to make your website stand out such as multiple product grid styles, sale bubbles, and quick zoom product images. When you need to choose a theme for a WordPress website, and you’ve decided on using a premium theme (which we advise! ), the most popular ones are often a good place to start your selection process. We have provided you with our list of the most popular premium WordPress themes for 2016 based on a number of factors. The list should give you a headstart for your projects this year if you were feeling a bit overwhelmed with the number of themes out there. What has your experience been with the themes featured in our list? Please let us know and subscribe to the comments section below! I would love to see GeneratePress on this list over a lot of the theme forest inclusions. Nothing against theme forest of course. Partner generatepress with Divi builder or beaver builder and you have a very powerful yet clean web design solution. Plenty of hooks and filters too if you like to use a child theme. Divi is great too… And headway. Would live to try Genesis… Haven’t had time as yet. So many themes, so little time! 🙂 Thanks for your comments, Paul! Thanks for the answer. Exactly! GeneratePress – very similar to Divi, but without the builder. I like these frameworks / themes… but also like to customise as much as possible with custom php rather than fill up with plugins. I find Generatepress comparible to Divi, but a lot easier to add your own child theme templates and easier to add hooks etc. Divi in my opinion maybe better for those that don’t want to dip in. Maybe GeneratePress is like a cross between Divi and Genesis in my opinion. I have tried a bunch over the years. My favorite is Divi. Great design, so many amazing built in features and a great supportive community. Thanks for this post! I’m a happy user of Enfold. I love the drag and drop page layout. Does anyone have a drag and drop WordPress theme that they much prefer to Enfold? The best premium them from themeforest is Jupiter. Period. I was surprised you haven’t mentioned it. Curious, what’s so good about Jupiter? Hi Arian. I had used Bridge before and no matter what I did it was slow as a turtle. I am rarely swayed by advertising but the Jupiter team was correct. I am not a code genius but it is advertised as fast. Nothing special about the theme as I designed from ground up and didn’t use a demo. I use WP Rocket along with Jupiter and switching over to Jupiter Pingdom score immediately dropped like a rock. However, I guess I am never satisfied with page load. I am always trying to improve it. Thanks for your insights Mark! Think I’ll examine Jupiter a bit! Max. Im glad you mentioned Jupiter theme. I just checked it out. The theme options are better than any other theme Ive used. 50 premade templates, 100’s of page elements, and the header customizer seem ahead of the competition. Max, whats the page builder like? Im exited out building a site with Jupiter. The problem with a lot of these premium themes is the amount of code bloat that comes with all the features, Divi is by far the best of the bunch. I just hope that Elegant Themes doesn’t head down the same path with Divi. The theme is only going to get bigger and bigger as it gets more and more standard functions. The big question is how big can it really get before speed is an issue. Same can go for the plugin as well. I am not a fan of theme bloat and a whole bunch of themes at themeforest have it. Absolutely agree with this comment, I’ve bought, used and developed with several of the ThemForest themes, including various versions of Bridge, but actually discovered Divi when someone I was building for showed me something they like, I found Divi and now on my 4th new site in a row on Divi without the Bloat. Really enjoying it and found a great community of help. For sites, I’ve only posted once in the forum, as I found the question I needed each time. I then purchased Divi and played with Divi builder. After several weeks I find Divi builder more difficult to use and lacking simple features like custom column widths, and instead you have to choose from a couple of templates. Great list. I would add th X theme. Divi is by far the best of the crop for ease of use and speed, while only lacking a refined header and global styling options. Avada is a HUGE resource hog and will bog a site down if the server isn’t top notch. Canvas has been left to languish for 2 years, about when I stopped using it. WooThemes promise an update to Canvas, but there’s no real evidence that they care about it. I think they need to focus on Woocommerce more than Canvas. Thanks for your comment John! Glad to see you’re loving Divi! Nice article Tom. I guess you will never please everyone but I agree with Chris. Jupiter is great plus it is fast. I have tried several of the themes that you listed and they all could go on a diet. Too, too slow due to code bloat. Thanks for this post. I am looking at every item on the list. This is very helpful and saves me a lot of time looking around. But now, my question is: Which theme will let me bypass the homepage and use the one most recent post to load up as the index? I’m talking about complete redirect to the last post, showing the full article with its video/images, and its entire comment thread. My thanks in advance! Grace I understand what you’re looking to achieve, but I think the best place to ask that question is on the WordPress.org forums. There are a lot of helpful people over there too. 🙂 Good luck! Divi and Betheme is my favorite WordPress themes. Both are an ultimate solution to build any type of website. Among all of them Genesis Framework is my most favorite WordPress theme. I have been using this theme for last two years and never faced any issue till now. Thanks for the share. Tom/Nathan – Would you say that Divi 2.7 (and the upcoming 3.0) with its Divi Leads is on par, functionality wise, for the most part with Optimize press? Hi Chris! I haven’t personally used Optimize Press so I can’t make a truly informed statement. That said, if I look strictly at the features I see both advertising it looks like Divi’s builder is more robust. And as far as I know, Divi Leads is the only split testing system built into any WordPress builder theme. In my mind, this makes Divi very hard to beat. And as you said, Divi 3.0 promises to be even better. Is there any information on what’s planned for Divi 3.0? We’ll be releasing some sneak peeks in the coming weeks. Avada can do pretty much anything for a start but themes based on the visual composure will always win in functionality, as visual composure has hundreds of add-ons and proprietary page builders does not. Yeah Visual Composer has loads of add-ons while DIVI and Cornerstone only have a few. I’d take Divi off that list since due to sloppy code WordPress 4.5 BREAKS Divi. So now here I sit with a recently expired ET account and now I have to pay to get the Divi fix that was their fault in the first place. The issue you are experiencing was actually fixed before the release of WordPress 4.5. All you should have to do to fix your site is make sure you are using the latest version of Divi available. Understood Nathan. I didn’t realize that UpdraftPlus was going to tank and make it impossible to restore a backup (which I did just before I upgraded). The point remains that there wouldn’t have been an issue to fix had it not been for the sloppy coding in the first place. I’m getting a little tired of being help hostage by companies like ET. A theme should never cause this big of a break yet it happened yet again with Divi. How convenient…. I think it’s a little harsh. If a theme is not kept up to date, or a plugin then the website failing to keep up to date is in danger of more problems than an error. Security of data is at risk. Panama Papers anyone? Your Updraft Plus will probably be useless if your site is broke of course. You might want to switch to something like Sucuri backup, or Vaultpress. Taking the need for your site to be fine to anable restore out the equation. ET aren’t holding anyone to ransom / hostage. They just offer a product, one that thousands of people think is fantastic value, and helps them in some cases start a business or helps them do things far more efficiently. It’s exactly what Nathan says… if you use any premium based tool / plugin / theme / framework, then it’s a choice that you have to decide if it’s right for you. Of course if you use free tools, you can get what you pay for. Nobody forces somebody to use a premium tool, it’s choices. On that note…I do think some of the themes out there are far worse than others, but I can say for sure that Divi theme / builder alone is worth the lifetime account that I paid for. I have lifetime / top level accounts with Beaver Builder, Headway, WPMU, StudioPress, Toolkit, Advanced Custom Fields… I’m spending just a few hundred £s a year on these combined, and they are the basis of a toolkit that feels far from being held hostage. Your error in particular is because you installed / upgraded to a WordPress version that was brand new and existed after the version of Divi you had installed. Even so, ET had patched it in a previous version. So the only combination of situations that arrive at a site breaking from this particular thing is not renewing a license. I spend more on my cell phone bill annually. I hope you fix your site soon buddy, I just think your blame is mis directed. As an afternote: there are a few best practices I would highly recommend adhering to in the future. -Always keep an active membership / license for any premium theme you are using. Updates like this are common yet important to avoid issues like the one you are experiencing now. -Staging sites–whether provided for you by your host or something you create locally–are great ways to avoid problems like this. By testing core, theme, and plugin updates there before attempting them on your live site you can encounter bugs or potential conflicts in a safe environment. I use X theme, Genesis Framework, Ultra from Themify and some others, depending on the project, this is really important, the project is the core. Divi is also one of the best choice for it’s simplicity and full translation for french users. And for me, it also its clean code that really helps any changes and also never conflict. I will add Ultimatum (half framework) to the list for bigger projects with the ability to create and integrate custom posts as well as creating template for each part of the site, it also use VC for pages. Thanks for your comments, Toma! Have you guys taken a look at Upfront by WPMUDEV? I haven’t had a chance to try it out but it seems more on par with Divi. Maybe Divi will introduce something like what Upfront offers in the near future? ? I’d love to be able to block off clients from the wp-admin dashboard and have them only interact with a front facing editor for blog posts and basic edit to page content. What is the rough timeframe for Divi 3.0. I am working with a client where there will be a lot of people doing various editing, and a front-end editor would be great. unfortunately we don’t give concrete timelines for our releases because the development process for them can be quite fluid. We will however be publishing some sneak peeks over the next several weeks. In all my Elegant Themes installations I have noticed higher, than with other themes, rankings. Aside Elegant, other themes are receiving great deal of features in each update. I have bought several themes over the last years in ThemeForest. What happens is that some themes become withdrawn after some years, so I can’t get any updates anymore for future WordPress releases. I guess this is always a risc when buying a theme on Themeforest and not from theme shops like ET. But as I notice how themes are sold on Themeforest, I gues I am not the only one with this same problem. How do you guys cope with that or avoid that? I have to agree, I have felt ripped off by abandoned themes on ThemeForest more than once before I switched to ET. Some of the vendors have very strange ways of doing business. My harshest experience was a premium theme that was abandoned on Theme Forest 2 months after I bought it including “lifetime updates”, but sold furtheron at the vendors own website just slightly renamed and with a different color set – and it required buying a new license. After inquiring regarding an update they declined stating it was a new/different theme and called that “their regular licensing policy” – I call that fraud and I have simply scratched ThemeForest from my list of trustworthy shops. BTW: I miss RocketTheme on this List. A few years ago I built most of my sites based on Joomla! (until it became that monster) and used their premium themes for several years. While their mainly flashy design style may not fit everybody’s taste (especially for clean business sites), their technical quality and especially their support is excellent and well above par. I just hope ET will eventually reach that level, too. how can i get Divi 2? Divi theme is one of the best theme ever (lots of useful modules). – it will be great to have “Event Calendar” module. I’m very partial to Divi, as after I lost access to a designer I was working with, I had to develop my site alone, from scratch, in a short period of time. 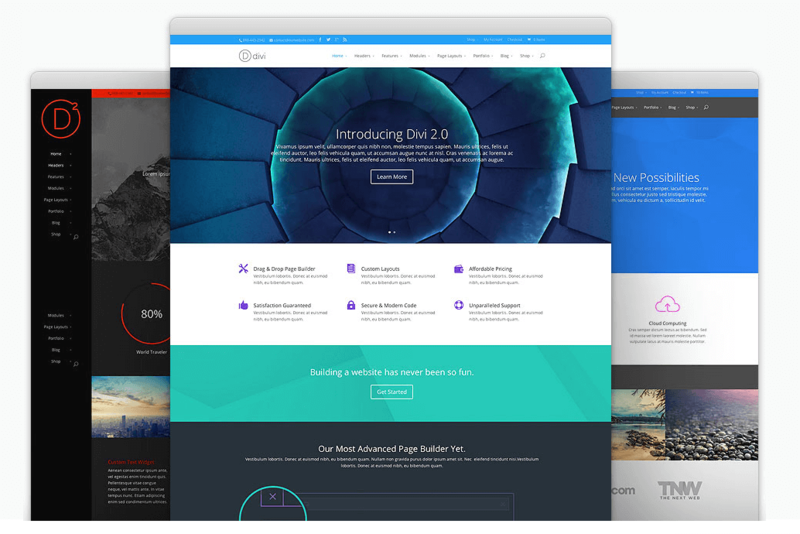 I researched most of the themes mentioned, and the Divi Builder is what ultimately swayed me. For a wordpress newbie like myself to end up with a professional-appearing site that my site visitors LOVE is a testament to the user-friendliness and simplicity of the theme. Love what you have done, ET! Thanks! Thank you, Joe, for your kind words! I’m very new to WordPress and to Divi. I use GoDaddy for hosting and they automatically update WP as a new version arrives and so it happened when they updated to 4.5 but this left my version of Divi somewhat broken. OK so it didn’t take long to download Divi 2.7 but what does a designer do if he or she has say 100 or more sites out there. Is there a need to check them all to ensure they are working correctly? Genesis Framework is my favourite. genesis is awesome and the best part is loading time is very low. Thanks for your thorough and thoughtful review. As a non-designer, non-techie, it can all be so confusing. Can you please suggest a theme for someone like me? Is Divi easy to figure out for a non-techie? I want to create a website/blog using WP to promote my business (psychotherapy and performance coaching) so I don’t want/need anything flashy just an attractive, simple theme that is appropriate for a professional. Any tips would be most welcome. Thank you! But for anyone out there that isn’t a developer…for instance a designer who doesn’t want to / can’t code very extensively…or even if you are neither developer or designer…I would recommend Divi. I honestly find most of the Theme Forest top themes are a combination / collection of too many third party heavy plugins all thrown together. If somebody doesn’t understand the basics of how these things are coming together, reduce your risk of the inevitable problems and go with Divi where so much of what you need is under one very highly optimised and fast solution. And a fantastic community and support base too. And secondly… Many of the Theme forest top solutions have so many features, the sites end up quite aweful (those that I have seen)…Using all sorts of sliders and effects and paralax everywhere…when it’s not even relevant or a good idea to do so. WIth Divi…you have many of these features, but the process of building pages starts with simplicity and you build from there. It’s a better process and gives a better result most of the time. I am so regretful of giving some clients access to Visual Composer… those sites I built for clients are destroyed by the power I gave them. It’s like I gave them Powerpoint to design their pages. But Divi theme is builder and theme all in one (yes I know BB has a theme too, but it’s BBtheme is not as good imho as divi). That’s my 2 pence / cents worth. And much appreciated it is Paul – thank you! I have used a few of those themes then I settled with Thesis for years, it was fantastic but you had to know a bit of code to try and customise your theme. Then I found Divi, its by far the most flexible theme I have ever used. Going forward I will be using Divi for all my projects. I think it’s because it meets the needs of my clients without me having to seek a load of external plugins or fiddling with to much deep code. Awesome Rod, glad to read it! I only have experience with Enfold, which I like quite a lot. Has anyone used both Divi and Enfold and can point me to an objective comparison of the two? Or, better yet, compare the most important aspects of each? I value being on the Elegant themes mailing list for all the good information they provide. I would like to give Divi a chance but need to know more about it. I’m really trying to love Divi but had to give it up when I realized they had very few archive layout options. Maybe Divi 3.0 will have some new layouts for archives! Great post, thanks for the research. I’ve used many and I actually wish there were a clear winner (because it would make life easier) but each has its pros and cons. Hey Bradley, Archives views are often the forgotten aspect of themes. I used to find that problem too. However, I can recommend the plugin wp toolset views (and types)… With this you can take complete control of archive views for all your different post types. It has some kind of official compatibility with Divi. I learned about a couple of themes I did not know before. Yes including Divi. I do have a question re: Annual Premium themes packages from a developer that include free themes too. When purchasing “all themes” does that mean you can alter CSS style files etc if you’re using one of the free themes included in the package. Trouble is, sometimes the layout/style you want is attached to a free theme & not a premium one & if you’re not a technical then it’s easier than having to build from scratch so to speak. This is the case for one of my websites. I am subscribing to your blog now, because I’ve spent 2 days trying to find the easy explanation of reducing size files, image etc & would you believe I found that information here: https://www.elegantthemes.com/blog/tips-tricks/optimize-images-for-your-wordpress-website. Anyway thanks to you all am subscribing now!! As for your question, yes you are allowed to alter CSS on free or premium themes. However, in both cases you will want to do so only after creating a child theme. This will ensure that as you update your parent theme the CSS changes you’ve made are not overwritten. Thank for the reply, I see I have a learning curve ahead of me. I’ve heard of child themes but as for creating one, well that’s another matter. I suspect you have info here within your blog, so I’ll do some searching. Yes I will be coming back often to learn from you guys – The Experts! Getting sick of flat menu backgrounds. Wish I could add a slight gradient to mine…. I rejected several of the above due to having such flat menus such as Canvas which I liked very much. I suspect more themes will start to employ Material Design this year – which may solve your issue! Divi, Enfold and Genesis Framework are my favorite on your list but I would also add a Monstroid Theme to the list. Eddie, this list only includes the most popular premium themes, but we’re glad you have your own favorite! Wow amazing list. Have to try Divi then.